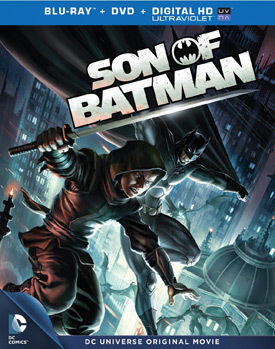 Jason O’Mara, Stuart Allan and Thomas Gibson voice the DCU animated movie Son of Batman. Watch the movie trailer and see the cover art below. Talia al Ghul (Morena Baccarin) reveals to Batman (O’Mara) that they have a young son named Damian (Allan). Trained from birth by the League of Assassins, Damian springs into action as Robin to seek revenge against the villain Deathstroke (Gibson), whom he believes killed his grandfather Ra’s al Ghul. Based on the 2006 comic-book arc written by Grant Morrison, assassins have taken over Batman villain Ra’s al Ghul’s organization. With her father believed to have been killed, Talia al Ghul (voiced by Morena Baccarin) reveals to Bruce Wayne (voiced by Jason O’Mara) that they have a young son named Damian (voiced by Stuart Allan). Trained from birth by the League of Assassins, Damian springs into action as Robin to seek revenge against the villain Deathstroke (voiced by Thomas Gibson), whom he believes killed his grandfather.